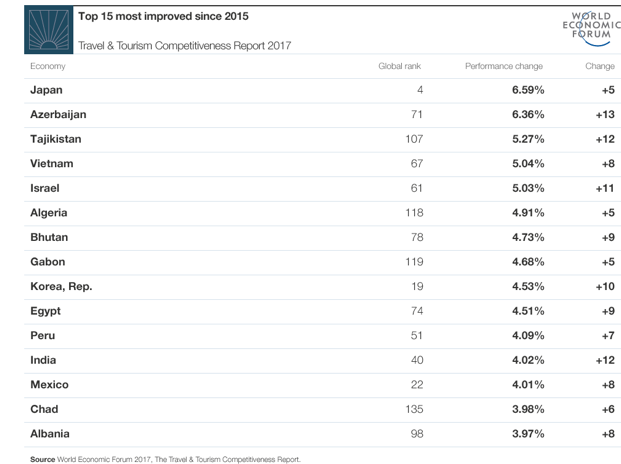 Buenos Aires, Argentina, 6 April 2017 – Spain, France and Germany continue to top the travel and tourism rankings in the World Economic Forum’s Travel and Tourism Competitiveness Report 2017, released today, but Asia steals the show as the region’s largest economies show the greatest rise in tourism-friendliness. The report ranks 136 countries across 14 separate dimensions, revealing how well countries could deliver sustainable economic and societal benefits through their travel and tourism sector. While advanced economies still hold the top spots in the ranking, 12 of the top 15 most improved countries are emerging markets, with Asia’s as exponents. Asia’s largest markets are not only becoming larger source markets but also more attractive destinations. Almost all of the region’s countries improved their ranking. Except for Japan, Hong Kong (11th, up two), China (15th, up two), Republic of Korea (19th, up 10) and Malaysia (26th) also made it to the top 30, while India made the largest leap in the top 50 (up 12 places) to land in 40th place. 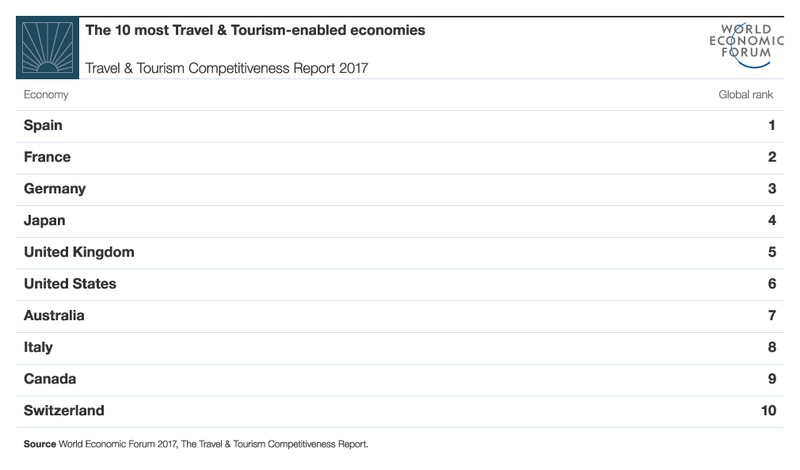 The Travel and Tourism Competitiveness Report 2017 finds that the increasingly protectionist global context, one that is hindering global trade, is not holding back international travel. Travel and tourism’s resilience is clear as the industry continues to build bridges between people and stronger visa policies are being developed to enhance security while facilitating travel. In light of the Fourth Industrial Revolution, evidence suggests that, connectivity has increasingly become a must-have for countries as they develop their digital strategy. The report contains detailed country profiles for the 136 economies featured in the study, including a comprehensive summary of their overall positions in the index and a guide to the most prominent travel and tourism competitive advantages and disadvantages of each. Also included is an extensive section of data tables that cover each indicator used in the index’s computation.